Seoul Semiconductor (KOSDAQ:046890), a leading global innovator of LED products and technology, announced that it has filed a patent infringement lawsuit in the United States District Court for the Eastern District of Texas, together with its affiliate, Seoul Viosys Co., Ltd. (collectively “Seoul”), against Fry’s Electronics (“Fry’s”), a retail company of consumer electronics. The patent litigation concerns Fry’s sales of various LED television products. Fry’s is one of the largest big-box retailer of consumer electronics in the United States. It has 17 mega-stores in California and 14,000 employees. Fry’s currently offers more than 300 LED television models featuring twenty-five different global TV brands. In its complaint, Seoul asserts that certain LED TV products in Fry’s stores infringe 15 of Seoul’s LED patents that relate to manufacturing processes for LED backlight units. Seoul’s patented technologies cover LED TV backlight unit structures, LED backlight lenses for providing uniform illumination of LED lights, UCD technology for high color gamut displays, LED packaging, LED chip fabrication, and LED epitaxy. These are significant technologies to improve the color, brightness, and duration time of all LCD light sources such as smartphones, laptops, tablet PCs and monitors as well as TVs. In particular, optical lens technology for offering uniform light distribution on TV or monitor displays is one of the most significant LED backlight technologies that Seoul has developed since the earliest days of LCD backlights. In order to protect that patented technology, Seoul actively enforces its patent rights against suspected-infringers. For example, in 2016, Seoul prevailed in U.S. federal court against Japanese lens maker, Enplas, with a judgment finding that Enplas willfully infringed one of Seoul’s LED backlight lens patents, as well as one of Seoul’s LED backlight system patents. Over the past few years, Seoul has also pursued patent litigation for infringement of LED backlight lens and other components patents against North America TV maker Craig Electronics and Curtis International and successfully obtained patent royalties from both companies. 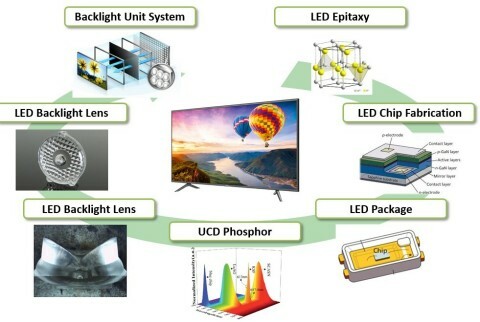 UCD technology (KSF) is another of Seoul's core LED backlight technologies that enables significant improvement of color gamut of LCD displays such as TVs and smartphones, which has been co-developed with a Japanese corporation for a long time. By enabling green and red light generated with KSF phosphors, UCD technology delivers 92-93% NTSC, which is higher than that of OLED. Prior to the filing of its most recent litigation, Seoul delivered notices of patent infringement to various global TV brand makers, as well as their suppliers who manufacture TV modules or TV sets in various regions of Asia, including China and Taiwan, through OEM or ODM. Seoul advised these TV makers and manufacturers that they needed to stop using LEDs and/or other components that likely infringe Seoul’s LED backlight lens and UCD technology patents. Seoul Semiconductor develops and commercializes LEDs for automotive, general illumination, specialty lighting, and backlighting markets. As the fourth-largest LED manufacturer globally, Seoul Semiconductor holds more than 12,000 patents, offers a wide range of technologies, and products such as SunLike – delivering the world’s best light quality in a next-generation LED enabling human-centric lighting optimized for circadian rhythms; WICOP – a simpler structured package-free LED which provides market leading color uniformity and cost savings at the fixture level, providing high lumen density and design flexibility; NanoDriver Series – the world’s smallest 24W DC LED drivers; Acrich, the world's first high-voltage AC-driven LED technology developed in 2005, including all AC LED-related technologies from chip to module and circuit fabrication, as well as multi-junction technology (MJT); and nPola, a new LED product based on GaN-substrate technology that achieves more than ten times the output of conventional LEDs. UCD constitutes a high color gamut display which delivers more than 90% NTSC.